This guy will be pretty happy about it. RATINGS AGENCY FITCH has upgraded Ireland’s debt from BBB+ to A- tonight, in a move that will make it easier still for Ireland to borrow from international markets. The move has been welcomed, with the NTMA noting that Ireland now has A ratings from two of the three major ratings agencies. 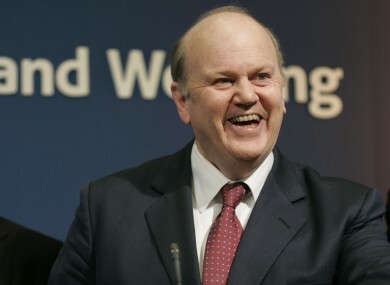 Fitch noted that the Irish government is sticking to its own fiscal rules as well as those set by the eurozone. It praised the “employment-led recovery of the Irish economy” and noted that vulnerabilities in the banking sector have declined. Fitch also said that Ireland has retained many of its structural strengths throughout the crisis. “It is a wealthy, flexible economy,” the report says. The head of the National Treasury Management Agency said he was happy with the move. “Today’s upgrade underpins the already strong investor sentiment towards Ireland and wil widen the potential investor base for Irish government bonds,” said John Corrigan. In a note published this morning, financial services firm Cantor Fitzgerald said that Ireland has made “substantial progress” on three fronts that Fitch said it would examine before making another upgrade to Irish debt. At the time, we were surprised that Fitch did not raise the outlook to positive. She said that improvements in the outlook for the debt-to-GDP ratio, a brighter economic outlook and a reduction in financial sector vulnerabilities were likely to have swayed Fitch’s hand this time out. With two out of the three main agencies now having a positive outlook on our government’s bonds, this in turn should broaden the scope of prospective buyers, as many investors, including insurance companies, many Asian investors, and some European central banks will not buy government paper until it is rubber-stamped by two main ratings firms. High levels of interest in Irish debt this year have helped push down the cost of borrowing from the markets. Hayes said that the upgrade “should provide a renewed boost to Irish sovereign bonds”. Austin Hughes, chief economist with KBC Bank Ireland, said that an upgrade would be “a reasonable outcome and is warranted by the changes we’ve seen in the economy”. It’s the ratings agencies catching up with the market dynamics. Commenting on yesterday’s dismal economic figures in core European economies, including France and Germany, Hughes said that the sluggish performance in the core is unlikely to affect Ireland’s relatively bullish growth prospects for the year. He said that several economic factors are aiding recent Irish growth while core economies struggle. Email “Two out of three ain't bad: another ratings agency gives Ireland an A”. Feedback on “Two out of three ain't bad: another ratings agency gives Ireland an A”.